My Lady & I have previously cruised with Carnival (5+ times each) and usually had a pretty good experience. We did our research before booking on the Vista since we heard/read about the negatives of Mega-ships (lines, impersonal crew service, lines, sold out excursions, lines, packed pools, lines, lack of lounge chairs, lines, standing room only shows at night, etc, etc). We fall into a demographic known as "active seniors", we love life, are thankful for our blessings of good health and decided to accept this challenge. And it turned out to be the BEST CRUISE of OUR LIVES. We had a ball. With a little pre-planning via the free Carnival Hub app on our smart phones we were able to avoid many of the perceived issues some were concerned about. We few into Miami the day before and decided to stay in the Little Havana section. Had dinner at Casa Juan, then walked around and people watched on Lincoln Road. Embarkation day went smoothly utilizing Carnival&apos;s boarding registration station at the airport. We were fortunate enough to receive a free upgrade to cabin 14-232, a spa balcony. One of the perks, unlimited use of the thermal suites. Patrick, our cabin steward was simply the best. Friendly, yet professional. Quick yet thorough. We found the service & food in the Horizon restaurant to be fine. My only issue, if you choose the "your time dining" option as we did, you to to 1st check in on deck 5 before proceeding to the restaurant on deck 3. 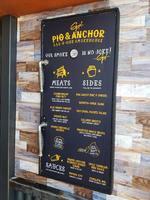 Loved Guy&apos;s Burger Joint, Seafood Shack, Guy&apos;s Pig & Anchor, & JiJi&apos;s Asian Kitchen. So many activities & entertainment choices to choose from. The Skyride is a must (very short line on 1st day), loved the water slides,the seaside theatre, and the Punchline comedy club acts. So much to do, never got a chance to try the IMax Theatre. Enjoyed our port of calls: if it&apos;s sun & fun you want, no excursion needed for Grand Turk (great beach right at port, especially if you walk further down where less folks will venture) or Aruba (short inexpensive cab ride to Eagle Beach: $13 US). Enjoyed the later night stay and shopping in Curacao & the VIP All Inclusive Saona Island excursion in La Romana, DR. We also loved cruising at this time of the year, nice headstart to the summer for Northeasterners like ourselves. One small thing I absolutely loved: the public auto hand washing stations using water thru out the ship. Awesome! So, bottom line, would we do it again? Absolutely, only this time aboard Vista&apos;s twin sister, The Horizon. Which will be sailing out of Miami in 2019, while the Vista will be switched to Galverston, Texas. 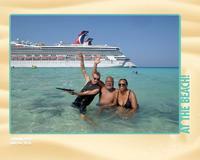 Enjoying the beach at Grand Turk, w/ one one crazy member of the crew, lol. My Lady & I have previously cruised with Carnival (5+ times each) and usually had a pretty good experience. We did our research before booking on the Vista since we heard/read about the negatives of Mega-ships (lines, impersonal crew service, lines, sold out excursions, lines, packed pools, lines, lack of lounge chairs, lines, standing room only shows at night, etc, etc). We fall into a demographic known as "active seniors", we love life, are thankful for our blessings of good health and decided to accept this challenge. And it turned out to be the BEST CRUISE of OUR LIVES. We had a ball. With a little pre-planning via the free Carnival Hub app on our smart phones we were able to avoid many of the perceived issues some were concerned about. We few into Miami the day before and decided to stay in the Little Havana section. Had dinner at Casa Juan, then walked around and people watched on Lincoln Road. Embarkation day went smoothly utilizing Carnival&apos;s boarding registration station at the airport. We were fortunate enough to receive a free upgrade to cabin 14-232, a spa balcony. One of the perks, unlimited use of the thermal suites. Patrick, our cabin steward was simply the best. Friendly, yet professional. Quick yet thorough. We found the service & food in the Horizon restaurant to be fine. My only issue, if you choose the "your time dining" option as we did, you to to 1st check in on deck 5 before proceeding to the restaurant on deck 3. Loved Guy&apos;s Burger Joint, Seafood Shack, Guy&apos;s Pig & Anchor, & JiJi&apos;s Asian Kitchen. So many activities & entertainment choices to choose from. The Skyride is a must (very short line on 1st day), loved the water slides,the seaside theatre, and the Punchline comedy club acts. So much to do, never got a chance to try the IMax Theatre. Enjoyed our port of calls: if it&apos;s sun & fun you want, no excursion needed for Grand Turk (great beach right at port, especially if you walk further down where less folks will venture) or Aruba (short inexpensive cab ride to Eagle Beach: $13 US). Enjoyed the later night stay and shopping in Curacao & the VIP All Inclusive Saona Island excursion in La Romana, DR. We also loved cruising at this time of the year, nice headstart to the summer for Northeasterners like ourselves. One small thing I absolutely loved: the public auto hand washing stations using water thru out the ship. Awesome! So, bottom line, would we do it again? Absolutely, only this time aboard Vista&apos;s twin sister, The Horizon. Which will be sailing out of Miami in 2019, while the Vista will be switched to Galverston, Texas. 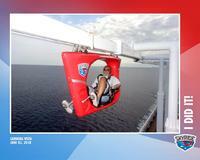 Loved it, 1st time having a cabin above the lido deck. 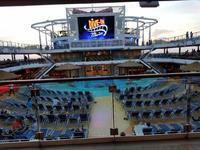 Took a little longer to reach the lower decks but increased privacy was well worth it. Plenty of storage space. Highly recommend port side statements, especially when booking a veranda. Booked the "VIP All Inclusive Saona Island". Boarded a speed boat to a Blue Lagoon, enjoyed ourselves jumping in waist deep water right from the boat far from shore, sighted a few starfish while having all you can drink rum cocktails. Then on to Saona Island for inclusive meal, more drinks, beach, sun, & fun. Stay in Little Havana, ate at Casa Juan (excellent). Strolled Lincoln Road shopping & people watching.